Start with a seed—literally—and end with a stronger, more resilient community. Discover the remarkable vision of Grow Benzie. This article is featured in the August 2017 issue of Traverse, Northern Michigan’s Magazine. Get your copy! 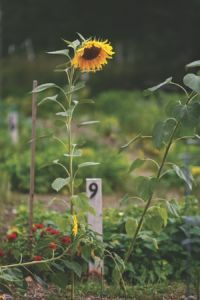 “I want to show you the seed library, the sewing room, our germination station—which is really a glorified grow room—and then the greenhouses, the community garden and then we’ll look at the event center with its commercial kitchen,” says Josh Stoltz. I’m quickly learning that interviewing the executive director of Grow Benzie, a food-centric, community-strengthening nonprofit headquartered in a bucolic valley between Beulah and Frankfort, is going to be an aerobic exercise. Josh Stoltz is that rare person who is high energy but relaxed, focused on the present but always on the hunt for new ideas. He left Northern Michigan for nearly a decade, focused on marketing and business startups. Now he’s come full circle. At a certain point, the very things that drove him away—small town living and mediocre job opportunities for young people—were exactly the things that pulled him back to Benzie County. Top on his agenda now is family, the environment and giving back to his home county. “I came back, and now I’m living the dream,” he says. It doesn’t take long to see that he’s got the skill set and temperament to lead Grow Benzie. He toggles seamlessly between welcoming volunteers, setting up new programs, leading whirlwind tours of the facility, helping children harvest food, working on the food truck, writing grants and creating short, entertaining YouTube videos that promote the center. Later tonight, he’ll speak briefly at a meeting of a nonprofit group that assembles self-help kits for girls in developing countries. At its core, Grow Benzie is about food and all that entails—from seed germination to nurturing plants, then harvesting the results of all that hard work and preparing healthful dishes and finishing the whole affair by recycling. Three large, hoophouse gardens contain startlingly beautiful herbs, peppers and tomatoes. For a small fee, Grow Benzie also rents out small garden plots to local families. Stoltz is particularly proud of a special garden where junior high students have planted heritage seeds. It begins to dawn on any visitor: this is a very busy place. 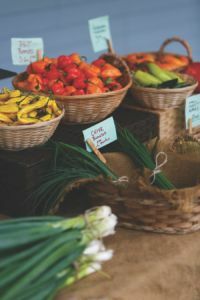 During the summer, Grow Benzie sponsors a Farmers Market that has become a popular place for local farmers to sell their fruit, cheeses, vegetables, meats and sauces. The market is also where Grow Benzie sells much of the food it grows. Meanwhile, the group’s bright red food truck is now seen at events all over Northern Michigan. Would-be food entrepreneurs rent the commercial kitchen to experiment and to create market-ready products like salsas and jams. It’s also where dinners are prepared for meetings of seniors, youth groups and other service-based nonprofits. Grow Benzie also partners with the Crosshatch Center for Art & Ecology to offer the “Get Farming! Keep Farming!” workshops to help farmers deal with the risks of finance, production and marketing. 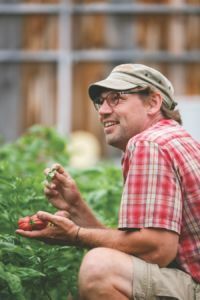 All of these food-related efforts—the educational programs, farmers market, food truck and commercial-grade kitchen—have helped make Grow Benzie one of the leaders in Northern Michigan’s farm-to-table movement. Grow Benzie began as a community garden. In so much of what Grow Benzie does, food is the starting point. That’s understandable because Benzie County has a long history of agriculture and because, as Stoltz puts it, “everyone likes to eat.” Part of that food goal is making healthy food affordable by participating in various assistance programs like Double Up Food Bucks, WIC Project Fresh, Senior Market Fresh and Grow Benzie Bucks. 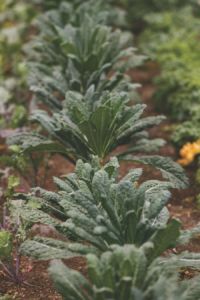 And there’s the even bigger picture: the notion that supporting the local food cycle all the way from seeds to recycling builds a sense of community and increases good stewardship of the environment. Grow Benzie leaders also hope that the organization can foster self-sufficiency and optimism in a county that sometimes struggles economically. The food truck features local produce. Grow Benzie has found a way to strike a balance between practical skills and idealism. Like any nonprofit, it relies on grants, private donations and various revenue streams. At the same time, there are educational and community-building aspects to everything it does. The farmers market, for example, is a revenue source. 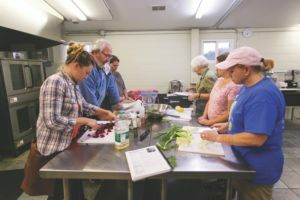 But it also offers a way to instill pride in farming and, as one of the rare places where age and income differences don’t seem to matter, the market builds a sense of connectedness within the Benzie County community. While standing next to the truck at a Traverse City Farmers market, Stoltz gives out food samples made with fresh ingredients but at the same time delivers Grow Benzie’s essential message: let’s eat, learn and live in a way that is good for ourselves, for each other and for Northern Michigan. Take a tour on Fundays. Gorgeous produce at the farmers market. Two volunteers pull up to the office house. They are part of what he calls his tribe—civic-minded people who get things done. They hug him, then he asks, “How’s your husband doing?” It is something asked out of genuine concern. Energized volunteers and an active board of directors “own” Grow Benzie. They make the organization run, whether it means working in the garden, preparing meals, maintaining the grounds, mentoring a young person or adult, or running their annual fundraiser, Bayou in the Barn, which is a Louisiana-themed event with music, food, and auctions held at St. Ambrose Cellars in Beulah. The newly arrived volunteers get started working, Stoltz continues the tour, at least until a visitor arrives unannounced. She likes to sew. And she’s looking for something to do. Stoltz shows her the sewing center and speaks with pride about how the community has made everything she sees possible—the donated materials and furniture along with the six sewing machines purchased by the St. Ann’s Church Men’s Club in Frankfort. She’s interested and promises to return. She might not know it yet, but she has just joined the tribe. Thirty varieties of heirloom tomatoes grow in the hoop houses. The Hive Minded project is an excellent example of how an idea can become a successful program—one that keeps expanding. The original goal was to resurrect an after-school shop class at Benzie Central by having students build hive boxes for beekeepers. Then a second use was found for the wooden boxes: with a bit of modification, they can also serve as targets for bean bag toss games. Just turn them upside down, drill a hole in the middle of what had been the bottom of the box, and attach a couple of simple legs. 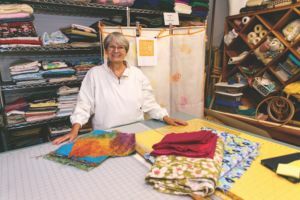 That, in turn, led to a third program—bringing back to life a dormant after-school sewing program to create bags for the bean bag toss games. None of these projects have generated much income. But the students have learned how to turn a profit by working with their hands (and each other). Those skills just might encourage a few more of them to stay in Benzie County, a place where year-round jobs can be hard to find. Grow Benzie offers cooking classes, canning classes and more. Next up, Stoltz shows off the 1,500-square-foot commercial kitchen with its enormous ranges, mixers, work tables and refrigerators. Then it’s time to go to the meeting room next door, where Stoltz introduces me to a cooking class that is underway. Nine students are present. 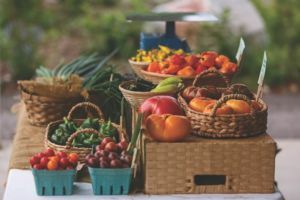 A chef and a nutritionist are demonstrating ways to use locally grown meats and vegetables to create nourishing meals. The tour ends in the ranch-style building that houses the germination station, a few offices, the knitting center and is where smaller meetings are held. For a brief spell, no phone calls or visitors interrupt Stoltz, and he reflects on how far Grow Benzie has come. He seems happy with the progress so far, but like any visionary, he is always looking for new possibilities. One idea: build a pond for recycling nutrient-rich wastewater for the garden. Another idea: build a couple more ponds to grow wild rice, in conjunction with local Native Americans. 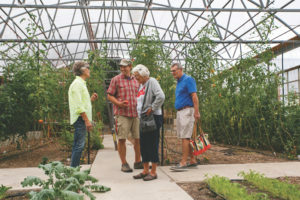 Josh Stoltz in one of Grow Benzie’s three 5,000-square-foot hoop houses. A few weeks later, Stoltz shares some surprises: he’s just heard of two new grants from an old ally, Rotary Charities of Traverse City. Under one grant, Grow Benzie will receive $41,000 to create an “edible trail.” Stoltz explains. “We mow all of this big lawn now, but why bother? Now we can turn the whole property into an edible landscape. We can make it wheel-chair accessible and lined with berry bushes. A trail will lead to beehives and an herb garden.” There’ll be learning stations, raised growing beds, dwarf fruit trees. And that’s just the start. A mini-golf course will also be in the mix, with the growing beds as obstacles. Naturally, each piece of the project will offer educational opportunities. All I can say in reply is wow. It dawns on me later that I’ve just joined the tribe. 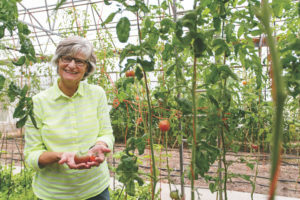 The other good news from Rotary is a $36,000 food “prescription” program that Grow Benzie will share with Munson Healthcare Regional Foundation. The grant will allow healthcare providers throughout the region to issue vouchers to increase their patients’ access to fresh food. Grow Benzie’s $13,000 portion of the grant will fund a mobile food trailer and nutrition courses for participants. “We’ve already piloted this at the Traverse City Farmers market, so we know it’s a success,” Stoltz said. 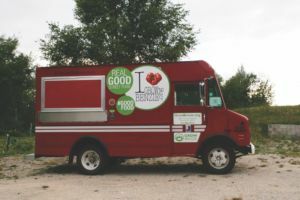 “People came to more of the classes than required and the feedback was very positive.” Grow Benzie hopes to continue the prescription program in the future with profits from the food truck and special events. Financial support, an active group of volunteers and a strong board of directors have helped put Grow Benzie’s buildings and programs into good shape. A good leader brings all of that together and builds upon that progress. Stoltz is thankful to be a part of it all. “I’m blessed with a unique opportunity. I think it’s just the general energy around this community that is inspiring,” he says. Stoltz adds that he thinks “people these days are looking for inspiration and a success story.” It seems both can be found at Grow Benzie. Clark Miller writes from Traverse City. clarkmillercommunications.com // Melisa McKolay is an award-winning photographer specializing in lifestyle portraiture & wedding photojournalism. mckolayphoto.com.